As we mentioned in our Seward post, we were not looking forward to a week on a cruise ship. 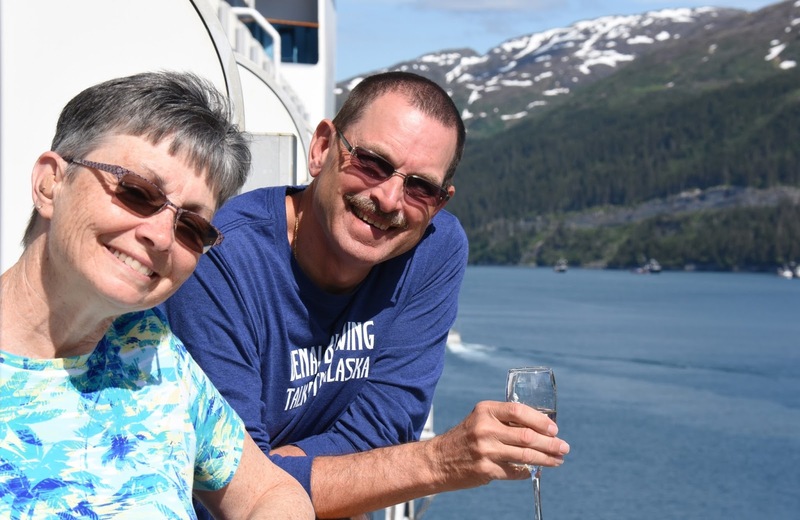 We have never cruised, but had impressions of what a cruise could be like from experiences during our land-based vacations. To us, a cruise represented a lot of process: Leave the ship at this time, get back by this time, stand in line for security, eat dinner with strangers..... Not relaxing to us. Additionally, we felt that we would just be in a floating hotel - no real grounds to walk around. Having our first two days at sea were terrifying. 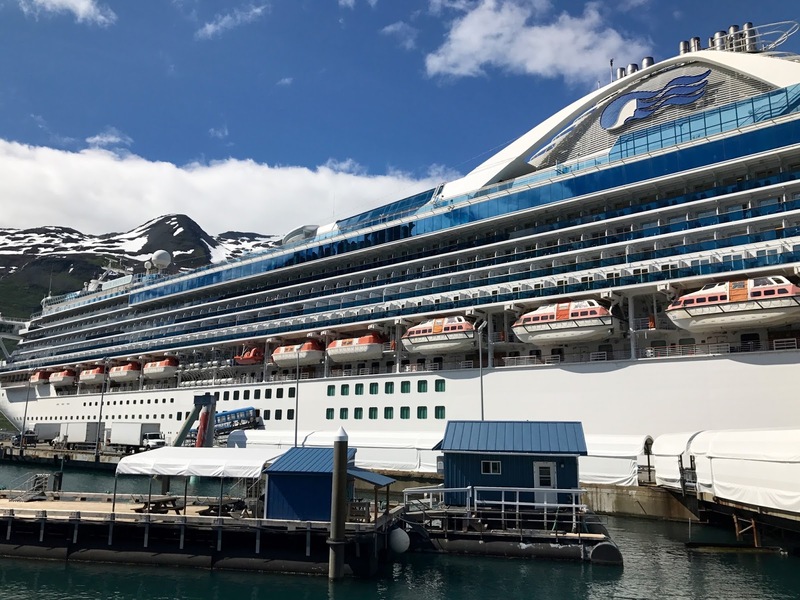 We boarded the Star Princess in Whittier, AK - a town created to service the cruise industry. Our bus pulled up to the big airplane hanger for us to start our check-in process. Luckily we arrived at a quiet time and the line was relatively short. We later discovered the train with 1100 passengers was arriving later in the day. Imagine being the last person in that line. Fortunately for the cruise line (because again we hate process) our check-in was about 10 minutes. We crossed the gangplank and entered the belly of the beast! Our ship in the center. Amazing how these things drop 6,000 people into small towns like Ketchikan. Onboard a crew member checked our tickets, directed us to a photographer for a welcome aboard picture (we just blew passed him), and were shown to the elevators in order to reach our cabin. Our steward (housekeeping on a ship) met us right away and showed us our room. Within a few minutes he brought us champagne and our luggage arrived within a few hours or so of being onboard. We had a mini-suite cabin that included a small private bath, queen bed, separate couch area, and 2 tvs. On the balcony we had a table, two chairs, and two foot-rests. Our travel companions flanked us on both sides. The furniture in our cabin was rundown. Our couch had some big stains and the carpet was peeling up in places. On the plus side, there was ample storage for our clothes and suitcases when not in use. We did not take very many pictures inside the ship. To get a feel for the room check this Cruise Critic link. We booked the cruise under the Sip and Sail promotion which gave us free beer, wine, liquor, and premium coffees with included tips. This made things a little more relaxed for us. We were happy to find many bars and lounges onboard and found service to be very quick. We were surprised that the actual prices for drinks was lower than anticipated - beers were around $5-$6, liquor drinks $8ish, wine $9ish. New Castle was on tap - which was good for us. Unfortunately they ran out half-way through the trip. Our ship did a round-trip starting in Vancouver - Anchorage for the first 7 days, then the reverse with a new set of passengers. We guessed they were not resupplied in Anchorage. 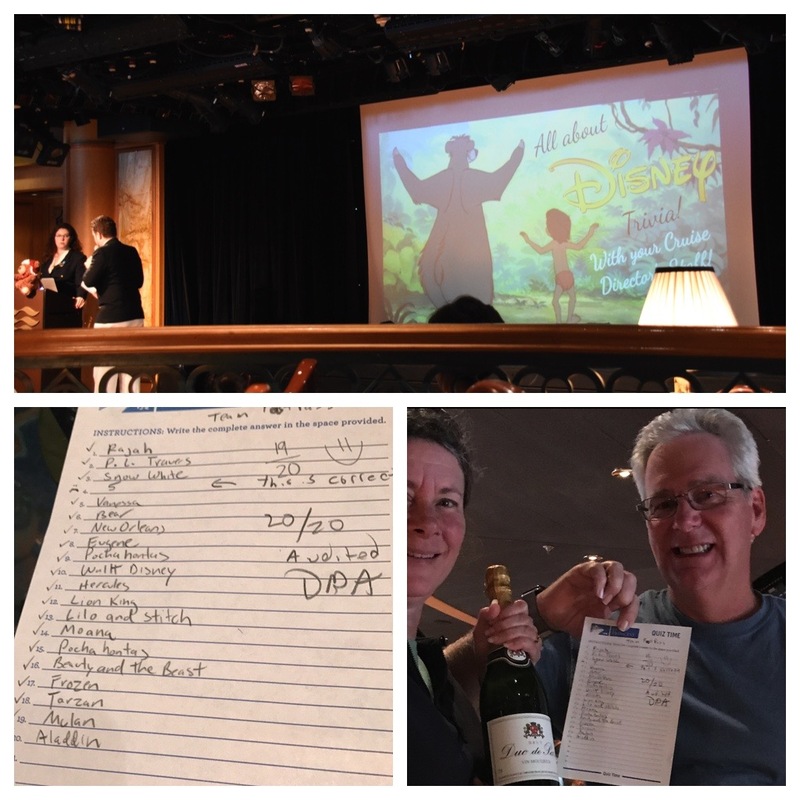 On Day 1 there was time for an activity before muster drill (like a fire drill but way longer) so our group played Disney Trivia in the lounge. We won and received a bottle of champagne. The other folks really did not have a chance. The muster drill ran long so we rushed back to the room and panicked about missing dinner. We wanted a sit down dinner and not the buffet or a burger. Luckily we had another 1/2 hour before the dining room closed. The food in the sit down restaurants ranged from "I can eat this" to awful. All the food was bland and cuts of meat were not the best. We only ate the buffet for breakfast and the first day for lunch and stuck with basic items. The pizza counter was great the first day, but was never the same quality the remainder of the trip. We did enjoy two good meals at Crown Grill, the additional cost restaurant. For $29 each we were able to have a high quality multi-course dinner. The filet mignon cuts were excellent and the desserts were creative. The ship did have a lot of bars and lounges where you could often find some great entertainment. We enjoyed listening to the guitarist and the jazz band. Service in the lounges usually excellent and the wait staff tended to remember our preferences. The dance club, perched off the stern of the ship, provided great views of the Alaskan mountains during midnight sunsets and was one of our favorite spots. Princess did a good job of keeping guests informed about their trip. The TV aired a daily talk show with the entertainment crew to go over the day's events. The shopping guide (an actual person) also had daily shows covering the specialties in the port, and where to meet him for fantastic bargains (this aspect of cruising was lost on us as we are not shoppers). Also on TV was the Alaska Channel with short documentary style programs. Everyday we received a copy of the Princess Patter, a newsletter detailing all dining and activities. The line waiting for a photo opp of fake-filling the champagne waterfall. Really? We went to the British Invasion show in the main theater one night. About 12-15 performers put on a 45 minute show focusing on British Rock. They were talented and it was an entertaining show. Another night we watched the Pub Show in the Explorer's Lounge which was a fun sing-a-long show that was actually meant to be cheesy and it was pretty funny. As part of the Alaskan focus there were several talks and demonstrations throughout the week on nature, wildlife, lifestyle, etc. we were bummed that they brought the sled dog puppies onboard during prime excursion time. Another positive: we booked our shore excursions directly through Princess. The prices seemed fair and we knew that we were guaranteed to get back to the ship on time. The three companies we traveled with were top-notch and we enjoyed our experiences. The ones we picked were all small groups so that helped. 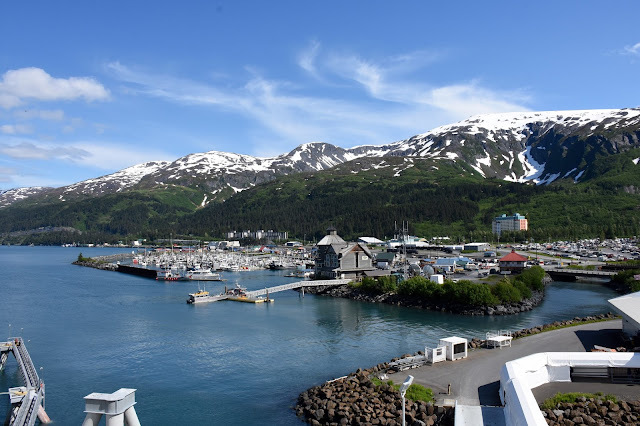 We'll cover those events with our posts for each port along with the day at-sea in Glacier Bay National Park. On our last full day at sea (we really hate these days) we participated in an add-on event: Silverado Wine Blending. The event cost around $35 including tip and provided us with a high-end cheese plate and a class on wine blending. We tasted 4 Silverado wines (a premium brand owned by Walt Disney's daughter) individually and learned about blending wines vs. drinking wines. Using a beaker we would concoct our own mixtures. Overall a fun activity. The process to get on/off the ship took all of our patience, which is what we expected. On port days they'd have the exit area setup with a character (people in costumes) photo opportunity. An eagle one day, a moose another, or a lumberjack. This slowed down the process unnecessarily. As we passed by quickly politely saying "no thank you" we were given stink-eyes by the crew. One morning Dave tried to leave the ship with a brewed (black) coffee. Not allowed due to customs. Since we were getting on a bus for our excursion this left Dave under-caffinated and cranky. Getting back on the ship was like going through TSA. We had a long line to get back onto the ship in Juneau and by the time we reached the gate Dave's patience wore out. After putting everything into the metal detector bin the staff pointed accusingly at his jacket pocket "What's in there?" He could not even spit it out, "They're my....my mittens!" We understand the need for security and we know it's necessary, but you don't have to deal with this at a hotel which is why we were always opposed to cruising. Disembarkment in Vancouver was a mess. We had to have our room vacated and luggage outside the door by a 8am. We arrived in port late which delayed our departure from the ship. It was so hard for us to stare at land just feet away out the window and not to be allowed to go near it. We were divided into groups with set disembarkment times and designated seating areas. Our code (White 2) matched our luggage tags. We were finally allowed to leave 40 minutes later than anticipated. Once off we had an easy time getting through Canadian passport control, but had a hard time finding our luggage. They did not group all the white 2's together so we were on a scavenger hunt. The port was nuts with people since several cruise ships were dumping off passengers like us and picking up new ones. Add to that the 150th anniversary of Canada and you have too many people in the same place. We were so happy to leave the area for the sanctuary of the Hampton Inn. After all that negativity we are still glad we took the cruise for the sites we were able to see. There really is no way to see some of the wonderful sights we saw without taking a cruise. As anticipated, the big ship cruise experience is not a vacation option we enjoyed. Too much process and following a rigid schedule and too many people all wanting to be in the same place at the same time. Plus, you are captive...so no local restaurants for dinner (we did take advantage of lunch time away from the ship). We didn't even get into the nonsense of formal night - two times in one week!! !